Emperor Heraclius at the battle of Nineveh. Before the reign of Heraclius (610-641), the army consisted of spear-armed infantry with a small but tactically dominant cavalry force. Maurice (582-602) tried to set up a territorial reserve of infantry archers, training once a week, but whether this got off the ground is unclear. The army then collapsed in the civil war and Sassanian invasion which followed Maurice’s death. 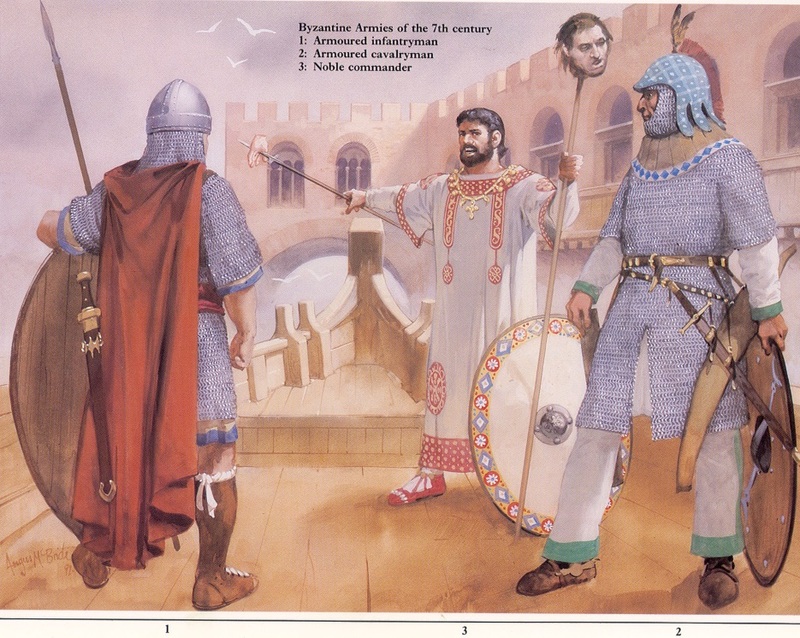 During the struggle between Phocas and Heraclius, anti-Phocas forces in Alexandria included regular soldiers, mercenaries, sailors, urban volunteers and the Green Circus Faction. These Circus Faction’s were more than supporters’ clubs, acting like political gangs in the Empire’s main cities. Supporters of Phocas in Constantinople included militias based upon other Circus Factions, plus sailors of the Egyptian fleet who, however, soon deserted to Heraclius. The 7th century was another period from which few illustrations survive. The best-equipped infantry appear to have had short-sleeved mail hauberks and remarkably large shields, plus spears and swords. This man’s helmet is based upon one found in Central Europe which may be of Byzantine form. The addition of the mail aventail is hypothetical, reflecting a high degree of Turkish and specifically Avar influence. His sword is based upon an unusual Scandinavian form which is itself likely to reflect Byzantine origins. This trooper has been given a plumed cap over his helmet, as worn by warriors from Iran and the Caucasus. This could be the explanation for the otherwise extraordinary outlines of many helmets seen in 7th-9th century Byzantine art. Turkish and Avar influences can be seen on the belt, sword and bowcase, as shown by surviving fragments and pictorial sources. One remarkable and recently discovered fragment of wall painting sheds light on the costume of the 7th century Byzantine elite though not, unfortunately, on their military equipment. A long tunic with richly embroided claves and three-quarter sleeves was worn over a long-sleeved shirt, either with soft riding boots or, as here, with highly decorated shoes indicating high status. The practice of impaling the head and hands of a defeated rebel, presumably as a warning to others, seems to have been common in Byzantium at this time. When he at last gained power Heraclius rebuilt an army out of this wreckage. He gathered scattered, leaderless but numerous troops, equipping the elite regiments and restructuring others. While working on existing foundations, Heraclius took his Avar foes as an ideal. His main problem remained a lack of horse archers, the cutting edge of a new army which took two years to organise and train. 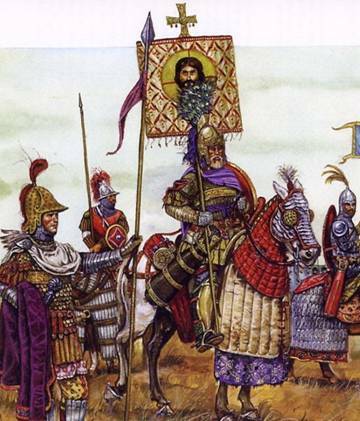 Heraclius then broke the tradition by leading this army into battle; moreover, he personally slew the Sassanian general Razates in single combat. As a result of the Diocletianic-Constantinian reforms the Roman army was separated from the civil administration, so that governors of provinces no longer commanded a provincial army (though they were still responsible for raising funds to support the army). The army was divided into two parts: there were troops protecting the borders, the limitanei, under the command of duces, and there was a field army, the comitatenses, which was mobile, organised in divisions under the command of the magistri militum. In addition there were the palace troops, and the imperial bodyguard, whose titles changed throughout the fifth and sixth centuries. By the end of the ninth century, there had emerged a quite different system, with the army divided into divisions called themata (or themes), based in provinces also called themes, each under the command of a strategos, who was responsible for both the civil and military government of his theme. There is no general agreement about how quickly this change took place, nor why (whether it was the result of some planned reorganisation, or simply a fumbling reaction to the problems of the seventh and eighth centuries). There is, however, general dissent from the theory, which once commanded much support, associated with the name of the great Byzantinist George Ostrogorsky, who saw the thematic army as the result of a deliberate reorganisation of the army and the Empire by the emperor Heraclius. The result, supposedly, was a peasant army, based in the themes, in which land had been allotted to peasant families as smallholdings, in return for each family providing and equipping a soldier. This somewhat romantic idea of the middle Byzantine Empire resting on the popular support of a free peasantry has been generally abandoned. The transition is now thought to have been later than Heraclius’ reign, and probably a gradual change. The idea that the soldiers of the themes were supported by their families, who had received grants of land, seems to be a retrojection of the much later notion of pronoia, whereby soldiers did receive land in return for military service. But there is no evidence for the system of pronoia until the twelfth century, and those who received such grants of pronoia then were certainly not peasants. Part of the problem is terminology. The word thema originally meant a military unit, and references to themata in the sources in the seventh century may refer to military units, rather than to the land where they were stationed. But even if it seems that the reference is to territory, since our sources are from the ninth century, by which time the thematic system was well established, we cannot be sure that such a reference is not an anachronism. As with the changes in civil adminstration already discussed, it is possible (indeed likely) that the two systems overlapped: for even though there are references to strategoi and themata in the seventh century, there is still mention of provinces (eparchiai) and governors, and use of such titles as magister militum well into the eighth century. The first themes to emerge are the Opsikion, the Anatolikon, the Armeniakon and the Thrakesion, together with a fifth division, the fleet of the Karabisianoi, which included the islands of the Aegean and part of the south-west coast of Asia Minor. Later these themes were subdivided, but their original boundaries correspond to already existing provincial boundaries. A likely explanation of the origin of these themes, without any close reference to timescale, is as follows. After the defeat of the Byzantine army by the Arabs, the troops retreated over the Taurus Mountains into Anatolia. But the years following the defeat, as recounted above, saw continual raiding by Arab forces into Anatolia, leading finally in the 660s and 670s to a concerted attempt by the caliph Mu`awiya to advance across Asia Minor and take Constantinople. In this situation of prolonged threat, the Byzantine armies were stationed in Asia Minor among the provinces. They would have been provisioned in the traditional way, by a levy raised by the local governors from the civilian population of the provinces. The areas that came to be called the themes of the Armeniakon and the Anatolikon were the groups of provinces where the armies commanded by the magistri militum per Armeniam and per Orientem were stationed. The theme of the Thrakesion occupied the provinces in western Anatolia where the army of the magister militum per Thraciam was established, having been transferred from Thrace to resist the Arabs, perhaps at the same time as the army of the magister militum per Orientem withdrew into Asia Minor. The theme of the Opsikion were the armies of the magistri militum praesentales, some of whom had probably long been established in the area across the Bosphorus from Constantinople. Their name derives from the Latin obsequium which formed part of the title of the officer who, during the reign of Heraclius, was appointed to command the praesental armies on the emperor’s behalf: he was the commander of the palatine corps of the domestici, called the comes domesticorum, but also the comes Obsequii. The Karabisianoi, the fleet, formed part of the old quaestura exercitus, probably based at Samos. It seems likely that all of this was established – that is, military units called themes stationed in the provinces of Asia Minor – by some time around about the middle of the seventh century. At what stage, and why, the civil administration declined, to be replaced by the military government of the strategoi, is much less clear. But presumably the overriding need to supply a standing army, combined with the final decline of the ancient economy based on the city, meant that the strategos, supported by the growing centralised administration emanating from the court, gradually assumed the functions of the old governing elite. The latter had itself lost much of its raison d’etre because of the increasingly bureaucratic nature of the civil administration.